TGIF for gardeners... 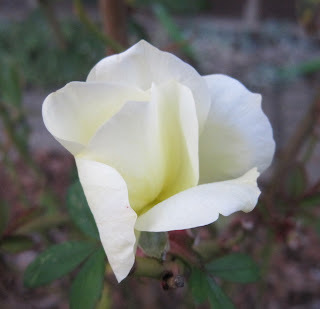 Thank God It's Flowering, or at least this white carpet rose was flowering a few weeks ago. I don't know if I'll find a dried up rose on the 15th for the next bloom day or not. Regardless, fellow gardeners from all climates, Garden Bloggers' Bloom Day will take place all through the winter. You'll be surprised how clever and resourceful we temperate climate gardeners can be when it comes to finding blooms in the winter time. *****Did you know that you can be notified via email whenever I update my blog with a new post? Sign up on the widget to the right and never miss a post again. Usually, the email shows up sometime in the morning. And no, you won't be spammed with email after email. According to Google Reader stats, I post an average of 5.1 times a week, so you'll get an average of 5.1 emails per week. Are you wondering where Hortense Hoelove is and what happened to her Friday advice column? Me, too. She went off to the garden late this summer, and hasn't returned yet. But if she gets a few questions, she might be lured back to answer some of them this winter. Send questions for Hortense to me at my Indygardener email address or leave them in the comments. There is a big rumor going around about a new bunny in town for Thanksgiving, who is of that same ilk as the Christmas Cottontail and the Halloween Hare. I love how non-commercialized Thanksgiving is, how if you do it right it can be a nice harvest celebration, a celebration of gardening. I hope the Thanksgiving Thumper doesn't ruin that! One of the greatest compliments one garden blogger can pay to another garden blogger is to expand upon an idea they've posted about, with a link back. Please check out this post on the Greensparrow Gardens blog. Thank you, Greensparrow! TGIF, Thank God It's Flowering Friday, and that we are going to have two beauitful days this weekend here in central Indiana. I'll be in the garden with Dr. Hortfreud and maybe Dr. Plantabulb. I might build a new raised bed or two, using the method I wrote about in my weekly newspaper column, Indy Garden Sense. Or maybe not. We'll see how it all goes once I'm out there in the garden. I hope you have a nice weekend, too! Will you get to spend some of it in your garden? I hope so! Oh my, can we be coming upon another Bloom Day already? If this beautiful weather holds, I might just have something actually still blooming on that day! I have been wondering where Hortense Hoelove was...I'll have to think of a question for her. Heaven knows, I always have questions:) Thanks, too, for the link to Green Sparrow's post; that was hilarious. I didn't leave a comment on your viburnum post, because would you believe I don't have one? As soon as Mr. Procrastinator digs up some dead shrubs, I hope to remedy that. Dr. Plantabulb needs to stop my garden, too. Our weather forecast for the weekend is also pretty and this may be my last chance to get the bulbs planted. I agree with you about Thanksgiving - what's not to love about it? I definitely need Dr. Plantabulb to pay a visit here Carol. I did plant a few hardy cyclamens and alliums a couple of weeks ago, but since moving here I seem to run out of steam by bulb-planting time. After patio and walk replacement here we had a major mess to clean up. I'm plum tuckered out and will probably be regretting my bulb laziness again come spring, when most other gardeners are glorying in the beauty of spring-blooming bulbs. The construction clean-up is my reason/excuse for burn-out this bulb-planting season. Besides, most of the bulbs I've planted here have become rodent food over the winter. If they don't eat them, they dig them up. If they don't dig them up, they eat the buds just as they're opening. Where's my bb gun when I need it?! It's 53 degrees and sunny here already, and the fallen leaves are calling me outside. Enjoy the beautiful weather, and have a wonderful weekend! I just finished planting more bulbs. I told my spouse that I must stop buying bulbs as I am running out of space He just grinned at me. It is a beautiful day and I plan to go outside find and pull a few weeds. The longest-lasting bulbs I ever put in the ground were planted in November... so I'm hoping I still have time to buy a little beauty for next spring. This has been my most mixed-up fall ever... so perhaps I need a visit from Hortense *and* the good doctor. Can they please bring their dibbles? The Thanksgiving Thumper ... that's scarier than the Halloween Hare!